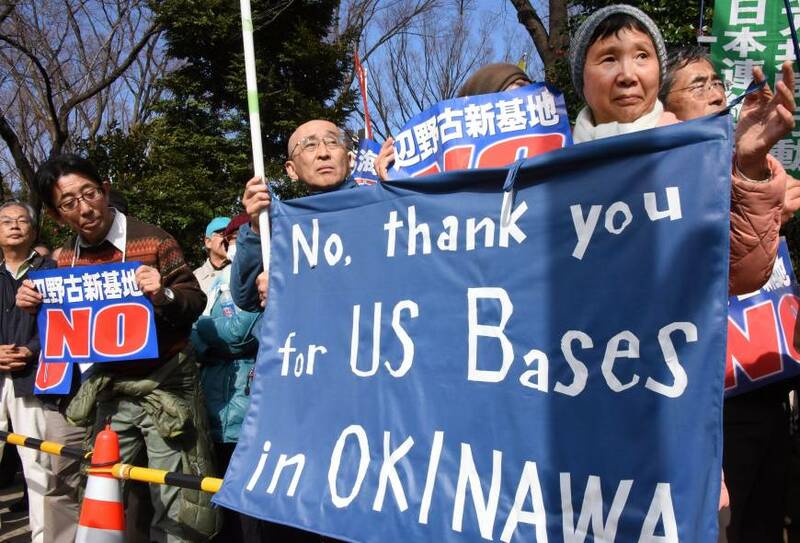 Thousands of protesters surrounded the Diet on Sunday to oppose the long-fought plan in Okinawa to move U.S. Marine Corps Air Station Futenma as simultaneous rallies took place nationwide to mobilize thousands against the unpopular project. 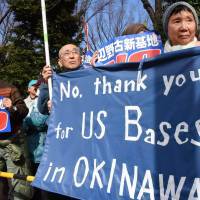 Organizers said about 28,000 people ringed the Diet building, chanting “Never allow the construction of a new base” and “Protect Henoko,” the district further north in Okinawa where the replacement base is being built. Opposition rallies were held simultaneously in the cities of Toyama, Okayama, Sapporo, Nagoya and Osaka. Japan and the United States have been pushing for nearly two decades to move U.S. Marine Corps Air Station Futenma from crowded Ginowan to the less-populated Henoko coastal area of Nago, both in Okinawa. But many residents fiercely oppose the plan and want the base taken out of the prefecture. “The central government is trying to force through landfill work to move the base to Henoko, but justice and righteousness are on our side,” Nago Mayor Susume Inamine said at the rally in Tokyo. “We can never tolerate a government that ignores democracy and local autonomy,” the mayor said. Junshiro Motoyama, 24, a member of the student group SEALDs (Students Emergency Action for Liberal Democracy) from Ginowan also participated in the rally. “There is an Upper House election coming up in July,” the senior at International Christian University said. “We don’t need lawmakers who want to wage a way,” and “Cheers for opposition parties,” Motoyama chanted with the other participants. Meanwhile, about 5,000 high school students gathered in Tokyo’s Shibuya district the same day to protest the controversial security laws enacted last year, which will expand the role of the Self-Defense Forces abroad. Similar teen rallies were also held in 14 other prefectures across Japan, including Miyagi and Osaka, with students marching to the rhythm of hip-hop music. Some participants at the Tokyo rally shouted, “We don’t want the right to collective self-defense” and “Let’s unseat lawmakers who supported” the security laws. The laws allow Japan to come to the aid of the United States and other friendly nations that are under armed attack, even if Japan itself is not under attack. It is scheduled to take effect in March but has raised fears that Japan might be dragged into a foreign war. “Everyone is unhappy” with the policies of the Abe government, a 16-year-old high school girl said in Sendai, referring to the nuclear reactor restarts and the railroading of the security bills through the legislature.